I've had darkness the past two days. Prior to that it was 12 hrs t5 while halides are out. All of the frags I have are less than two weeks in my tank (sps). The tank they came from were led, high intensity and were growing. How. many hours a day shall I run the halides? 400 watt, about 12 inches off water surface, 20 inch deep tank. Thanks for all the great reading so helpful. I have a question about lighting and would like your opinion, I’m not sure if my LFS is just trying to sell something 3 times the price. On a 72”tank 26”deep would 2x36” Current USA Orbit LED lighting with 144 led’s, 72 daylight and 72 actinic on each fixture total of 36 watts each, and 4x36” T5 HO 10,000K daylight be enough for various soft corals. My LFS said I would have to go up to the USA Orbit Dual Pro for corals. I value your expert opinion. Thanks is advance. <Mmm; well.... depends (as usual...) on what you mean by "corals"; where they're placed, and what you want them to do mostly (there are a few other more minor considerations). Allow me to expand. There are some "low/er light intensity" stinging-celled groups; like Alcyoniids/soft corals, Pennatulaceans/sea pens.... and even amongst stony corals; typically the fleshier so-called large polyp corals are less light demanding (not all) than the small/er polyp species; notably the Pocilloporids, Poritids and Acroporids.... then again, not all of these share the same light-adaptability/use/tolerance. Re the placement; of course one can "mount" their organisms "up higher" in the water column; adjust the PAR/PUR exposure therein. And the note concerning "what you want"; refers to whether you'll be happy w/ a slower boat under wind power, or that you prefer the fast motor boat of high energy input; along w/ the necessities of current/circulation, alkaline earth and other nutrient application. To sum up: You COULD get by easily with the first fixture here; and IF you wanted more color, growth (with the concurrent maintenance mentioned); you could use the second. First let me say that I am so very grateful to all of you for this wonderful service you provide. The wealth of information in the FAQ’s is invaluable, and the timely and knowledgeable answers each time that I have asked a question has been greatly appreciated. Even though I have not had a tank set up for the last two years, I’ve still been regularly reading FAQ’s and learning more and more. The question is would this light fixture allow me to have live rock with macroalgae and POSSIBLY a few soft corals in my size tank? Please could you let me know if the following lighting is enough for my 4'x2'x2' reef tank: 8 x 39watt T-5 arcadia marine white 14,000'K tubes, as my corals do not seem to be thriving nor my purple coralline algae growing! Let's see if we can throw some light (I know, bad pun) on this issue. First off, know that I am a HUGE fan of advanced fluorescent lighting technology. T-5's and even newer lines generate a good amount of useful illumination, at reduced cost compared with older tech., and generate a pittance of waste heat. This being stated, MH and HQI lighting do still have their place, particularly for large, deeper systems with light-needing photosynthetic life. So, the issues I have with your lighting? Well, the wattage consumed and the Kelvin rating PAR produced could support some species of 'Corals' (the quotes I place are for the discrepancy between what science and hobbyists consider such'¦ the former is much more limited'¦ just the Alcyonaceans and Scleractinians, i.e. soft and hard classes). 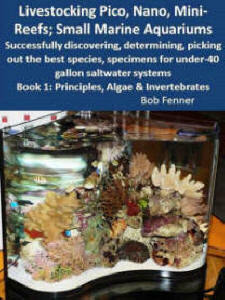 With placing the higher light-intensity species higher up in the water column, on stacked rock, you could expand the selection of coral groups even more so'¦ But do note my statement in the first sentence of this paragraph'¦ 'could support''¦ That is, keep alive'¦ but not particularly thriving. If you have not purchased the T-5 fluorescents, or don't mind trading them in, I encourage you to instead seek out metal halide or HQI fixturing here'¦ for the size, shape of your system, two 150 watt fixtures would be ideal'¦ Some might even encourage 250 watters'¦ The 'temperature' of the lamps I'd use would be a bit less 'cool' than the present proposed'¦ I would go with 10,000 K or even 6,700 K lamp; being more functional and better looking to me. I do hope I am not confusing you Dave'¦ but the issue of the coralline non-growth is likely totally unrelated to your lighting here. 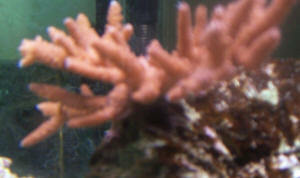 Most cases of poor growth of encrusting Red algae are a matter of either a lack of alkaline earth content (check your Calcium and proportion of Magnesium here) or deficient alkalinity and pH (they need both), secondarily the presence of predators that scour them mostly during the night. Unfortunately you don't list what your other livestock consists of, but a good stockist will be able to ferret out if you have a coralline eater present. The biomineral issue may also be playing a factor in your apparently non-thriving corals'¦ Do bring a list of what supplements you employ, what tests you have to your LFS for their review. Hello guys, I just have a question regarding LED lighting for a 55 gal reef tank. My tank crashed a few years ago because my 4x 65w PC flour light failed and at the time I could not afford a replacement. Now I would like to get it started up again and trying to decide on a fixture. My budget options are either a 4x55w T5 fixture or I found a LED option on Build My LED which would only be around $75 more. They seem to have very good reviews and list that PAR around 12" deep runs around 140. I would like to try some LPS corals and possibly a E. quad anemone in the future. Any suggestions would be greatly appreciated. corals/clams/anemones respond to which is commonly referred to as PUR (photosynthetic usable radiation). To properly tune a spectrum capable of providing the proper light spectrum for these type animals requires a spectrometer to aid in developing a spectrum. Can Build My LED provide you with a spectrograph of the light being emitted from their lights. Most photosynthetic animals do best with a spectrum between 390-550nm and 620-700. This range provides the light needed for good growth and color. Please read here and related articles found in the header. I am getting ready to upgrade my lighting. I am going for a 1000 watt MH setup over my 2.5 gallon pico. which at the moment is bleached but has settled in and in the week I have had it I see a marked difference in its appearance and its food response. I also want a Crocea or Maxima clam or two at some point. Anyway the question I would like to ask is whether or not corals can be seen fluorescing at depths where the light is mostly blue? I am having a hard time deciding if I want bluer bulbs or if I want to stick with 10k's or even 6500k's. I love the fluorescence but I also want as natural looking a tank as possible too. I may just supplement with actinics so I can view the fluorescence at night and in the morning like a sunrise effect. Either way the upgrade is going to happen in a couple weeks. I have175's now and I know they are not going to work with the Sebae and Maximas and or Croceas. Thank you for all you put into this site. It has already taught me volumes. I forgot to tell you the depth of my tank is 24" and it is a 120 gallon tank. I wanted to know if you think I should go with 250s or 400s with the animals I have and want to keep? Thank you as always. <Three 250's is what I'd go with. Likely w/ some specialized fluorescents... Or do a bit of reading/searching re recent LED technology. <Three 250's is what I'd go with. Likely w/ some specialized fluorescents... Or do a bit of reading/searching re recent LED technology. <<If it were me, I would seriously consider LED lighting over this tank. In the long run it is much less money. With energy savings and no yearly lamp replacement costs, the savings will pay for the LEDs and they offer high PAR (depending on brand) and the proper spectrum that corals/anemones best respond to. Another factor is low heat which requires no fans or chillers. Hello crew and whom ever responds to this email. I have a lighting question as I would like to start adding corals to my 75 gallon tank. I have approx. 100lbs of live rock and a 2in. sand bed. Inhabitants are a 3" Blue Hippo Tang, 1 small blue/green Chromis, 1 Ocellaris Clown, a Bartlett's Anthias in a couple days, which will get quarantined before adding, and 3 gold and black Chromis a couple months down the road. I currently only have T5 lighting- 120V with one 10K daylight and one actinic. I would like to keep 4 Ricordea Mushrooms, 10 or so "regular" Mushrooms, 1 or 2 Zoanthids, 1 Sun Coral, 1 Green Birds Nest and 1 Pulsing Xenia. Later I would like to keep a Clam and Acans if possible. All of this of course depends on compatibility and light requirements, which is my reason for writing :) I have found a MH light with (2) 150W HQI 15k bulbs (would probably change to 10k when time to replace) and 6 blue led's (6W total). Is my T5 sufficient for any of these corals if placed near the top of my rocks? If not is this particular MH? Could I use both the T5 and MH together if necessary? Can all of these corals be kept together? 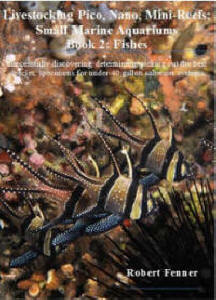 <I would use caution if you plan on any Zoanthids from the Genus Palythoa. They contain palytoxins which are very potent and can pose a health risk to other corals/inhabitants and also to yourself. Best to handle these types of corals with disposable examination gloves. Please read here re compatibility. James, thanks for your response! The tank is 48" long by 18" wide and 19" deep. I think I will go the route of the 300W MH for the long run if you think it is suitable for my tank size. I am also going to add an AquaC Urchin protein skimmer w/ drain and MJ 1200 pump to run in my 10 gallon sump. Is this skimmer recommendable in your opinion? Do I need to add carbon to my wet/dry sump once I add corals? I currently just have bioballs and filter media. The zoo I would like to get is Zoanthus sp. "Bam Bam Orange", so shouldn't be any issues there right? I also forgot to mention green and yellow polyps, are they compatible the others? I also wanted to get a BTA for my Ocellaris, but I will try Frogspawn instead since an anemone shouldn't be added with corals. Lastly.... I know, I know, lots of questions... can I quarantine the new corals and my Bartlett's Anthias together in a 10gl QT? The corals for 2 weeks, and the Anthias for an additional 2 weeks? I am setting up a new tank. 55 gal reef. I want to put two 65 watt power compacts over it, but this is not a lot of light. Would this be enough light for Euphyllia species placed high on the rock work? Is it enough for Brain, Disk, or Elegance placed in the sand bed? The corals wont be added for at least 4 more weeks, so don't feel obligated to reply immediately. want any sort of electrical problems to occur anywhere near the water. My tank has Duncan, Open Brain, Trumpet, Galaxea, Orange Sun, and Frogspawn corals in it. I am replacing the hazardous setup, but I am unsure about which options would be best. I don't plan to keep SPS, so I shouldn't need a Metal Halide. I really like some T-5 hoods, but I don't know if they would produce enough light. I was thinking about using a Coralife Hood with four power compacts for light. should I look at getting a 150 watt Metal Halide? I know the usual recommendation is to go with Metal Halide, but I don't want to make lava, or have to buy a chiller. If the Halide is the best option should it be hung above the tank or set up on brackets? Thanks for all your previous help too. My ballast for my MH suddenly started smoking...thankfully I was home! Needless to say, it will need to be replaced. I have a 220 gal tank..36 in deep and currently have 2 96w VHO and 3 175watt MH in the canopy. The lights have sustained the 3 anemones, Zoanthids, leather coral, devils hand, Acropora (high up), brain coral, flower pot, and xenias, they haven't really grown a whole lot. I have only had them for 3 months or so though (not sure if I am expecting too much in terms of noticeable growth). My question is, would it make a big difference to these corals if I kept the lighting at 3 175 watts, or should I upgrade to 3 250 watts. http://www.marinedepot.com/Current_USA_TrueLumen_Pro_LED_Striplight_20_Inch_LED_Light_Fixtures-Current_USA-CU03000-FILTFILDTN-vi.html but do not know how many strips to get and in what range. I thought about doing a few 48" strips (tank is 72 long and 36 wide) and doing a combination of the colors listed as options. What do you think? How many led's are needed? I am embarrassed to say that the lighting is really confusing for me. If you wouldn't mind looking at the link I gave you and actually telling me what would work best for my tank I would be SO thankful! <I did, and as above, not enough light for your deep tank. which comes with the ballast and bulbs. Does it look like this system can be mounted inside my canopy? I have a great oak canopy that hangs from the ceiling that I really love. What is the difference between mogul and hqi bulbs? Is there another option that would be better in the same price range? I want to grow SPS/clams/Acropora/etc. Thanks for taking the time to sort through my options....I do appreciate! I see frequently that corals have 'low', 'moderate', or 'high' requirements. 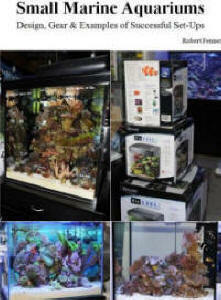 I have four 65 watt PC's over my 55 gallon aquarium; one actinic and three 10k. I think its 'low to moderate' but what would you consider it? 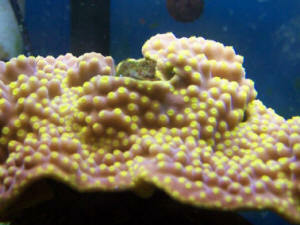 Intended corals to be kept are Bubble, Frogspawn, Candy Cane, Trumpet, Open Brain (Trachyphyllia), maybe Hammer or Torch. Would this be enough with regular feedings? What would you recommend feeding, because I feed my current predatory invertebrates pieces of fish or Kent Zooplex? Is this inadequate? After doing some research on you terrific site, I have decided to leave the BTA's and such at the store and instead try mushroom coral. I have had a 55 gal. fish-only tank with: Two Damsels (Domino and Four Stripe), Live Rock(15 pounds), Turbo Snails, and a Pencil Urchin. I found that I need a stronger light and ordered two of these: http://www.petmeister.com/item2131.htm. I want to be able to keep Lobe Brain, and Bubble Coral some day and was wondering if these are strong enough. In general most Coral would be housed within eighteen inches of the surface. I also was curious as to if it were possible to buy better lights and use the same fixture when replacing? Nitrite-0, Nitrate-5-20 ppm, pH-8.2, Alk.-390, I have added a second filter and there are no 'dead' spots in the aquarium. I intend to get a Powerhead soon. I also wanted to know if these will get to big for the system. I also searched the site and found I need to supplement the diet of the coral and was curious if they would benefit from strictly metal ions or protein as well. <With regular water changes any metal ions required would be present. Also, is the system currently over stocked or would addition of two Fire Gobies be okay? <No Fire Gobies with those two monsters you have now, but yes, you could add a couple more smaller fish. I have found on the web site it should still be okay but I would rather not have a major catastrophe and therefore wanted a second opinion. I am also slightly confused on the calculation of P.A.R. <PAR> as I could not find the page on the site though I know it is there somewhere. <PAR is not a calculation but a measurement of photosynthetically active radiation. Best to read here and related articles/FAQs found in the header. Thank you for all the help thus far. 55 gal. with about 2-2 Â½ï¿½ sand bed and about 50 # of live rock. I am running a protein skimmer, Canister Filter, and an over the back filter for PhosZorb Cartridges. My hood has 2-65watt 10K Daylight PC bulbs and 2-40watt 420nm actinic bulbs along with two LED moon glow fixtures inside the hood. The hood also has a reflector mounted in the top of the hood. The moon glows are on a moon phase controller. I have 2 Perc. Clowns and two yellow tail damsels. I also have an assortment of snails, hermits, Brittle star, emerald crabs (3), cleaner shrimp, and basically a cleaner crew. I am new to the saltwater hobby but so far loving it! 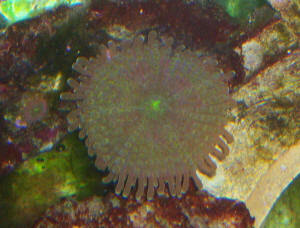 I also have a colony of green star polyp on one of the live rocks and a bubble tip anemone. My question is can I get some coral to work with my current lighting? I would like to get some Zoos, as well as some Ricordea, and maybe even some hammer or frogspawn type LPS. Any advice here would be greatly appreciated. The BTA has only moved one time in the past month,(due to the fact that the cleaner shrimp was trying to "clean/steal" the food out of his mouth. But I will monitor it closely. Do you think in lieu of the new lighting would it help to have three daytime bulbs @ 65 watt or maybe I could step up to 96 watt bulbs? Do the Blue actinic do anything for me? I am not trying to short change anything but being new I have to add to my system slowly of course due to funds available. <Depends what the nanometer range of the actinic is. The Zooxanthellae found inside many sensitive and deeper water corals require more of the blue spike in the range of 400-450nm. The green star polyp seems to really come alive under the actinic when I just have it on for a few hours before and after my daytime bulbs. I believe it is 470nm. I guess I could just remove one of the PC actinic bulbs and replace it with the 10k daylight? That way I can get more beneficial light. Also a question, I have three Emerald Crabs in the tank as well. I have read on several of your faq's that they can eat Coralline Algae. Is this true and if so should I be getting rid of these three crabs that I thought were very neat to have. I just thought they would eat waste and left over food from the tank. <The Emerald Crabs are respected for their scavenging ability, and like most crabs, opportunistic feeders. They will feed on uneaten meaty foods and many types of nuisance algae including Bubble algae. Thanks again for your prompt answers. Do they make a 12k bulb for PC? Thanks for the info on the Emerald Crabs. I think I will just keep them and enjoy them. Going to a 96 watt bulb instead of 65 watt doesn't really make a difference does it? They both are still 10k. I will have to see if the set up I have can handle that. Probably not. I will probably for now stick with my PC and go for some of the corals that are going to do ok in that amount of light, like the Zoas and Ricordea. I have time to enjoy it and add as we go. One more question do the Star Polyps I have in the tank now need a supplemental feeding? I have noticed that in the month they have been in the tank they are filling out quite nicely and I have cut a piece and started another colony in another area. I have not added anything to the system to this point. Thanks again for you<r> time. Thank you, thank you, thank you! I must say again what a wealth of great information you have, thank you! which I would like to steer clear of. I am planning on keeping the less light demanding mushrooms off to either side of the halides, and center tank, as the brace would be shielding most of the light from over head, and the sides should have less intense light, as halides are said to cover a 2'x2' area. As far as reflectors are concerned, what should I be looking at? I don't want to toast anything, but I also don't want any of the SPS I decide to keep to starve. I have access to be able to make my own parabolics, but I was thinking of getting some Reef Optix 2, as they are fairly reasonable, since I don't need sockets. Perhaps I might get better reflectors down the road as money warrants, but I don't know if they would really be needed if I kept everything towards the top of the tank anyway (due to the LR formation in the tank). Actinic supplementation isn't really an option right now, so I was looking at getting a higher Kelvin bulb. Right now it seems that the 20000k bulbs are a good option, though I was thinking about possibly getting 14000k bulbs, though I can't really decide. Any suggestions here? Over all, I would like to make this the last light upgrade I do for the tank, so if it sounds ok, or needs some tweaking, please let me know. <Justin, before I get started, please reply to the original thread. It helps to know what went on and, when mail comes in, it all goes to an inbox which is sorted out by crew members. I do apologize on not giving all the LxWxH and distance from water surface. The tank is a 72"x18"x22". I have a 6" sand bed so, from the top of the water surface to the sand bed it is pretty close to 16". I was planning on keeping the lights somewhere between 8"-10" off the surface of the water to allow ample room for my fans to push some air across the surface of the water to help reduce some of the heat. As far as the comment"<Although metal halides do produce a lot of light, there will be much light lost without the use of a reflector. You have to realize the halide lamps emit light 360 degrees.>, I was planning on using a reflector off the get-go. per reflector on Lumenarc/Lumen Max isn't an option right at this time. At most the SPS will be 6"-8" under the surface of the water, so I am not really sure if I need to spend all that extra money on the reflectors, with the corals sitting in such close proximity to the lights. sure if the lights will be intense enough on the sand bed. My name is Ryan and I am trying to put a saltwater aquarium together. I am looking into some coral that need high intensity lighting. Seeing that my tank isn't very deep, couldn't I get by with using fluorescent tubes instead of metal halide lamps? These MH lighting systems are very expensive! Whether I can or not, what do you suggest? Id prefer the cheapest way possible that is still successful. <T5 HO lighting is frequently used for shallow coral systems but they really aren't that much cheaper, if any, providing you have a custom wood hood that will allow a DIY job using separate components. May want to read here and related articles found in the headers before taking the plunge. I needed your opinion on some lighting issues. My first option is to stick to a T5 fixture over my 12 gallon Nano. The light itself is 4x8w t5s, 2 10k and 2 actinics, 32 watts total. My second option is the 70w 20k metal halide. Would the t5s be sufficient for sps and lps? Or if I use the metal halide, how far off the surface of the water should the light be? I have a question for lighting a 79 L x 22 W x 27 H tank. (27inch all water). I have not planned yet what kinds of corals I will be putting, but I would want my lighting setup to be enough for whatever I will be putting in it. LPS,SPS, softies! Will CFL lamps be enough? If yes, how much watts and tubes will I need? I am having second thoughts on using MH because of the electric consumption it will be using plus the heat it will generate. I have scaped by tank in a way that I can place the more light demanding animals to be higher. One more thing, how about the product Microbacter7 from Brightwell, are they any good? <A great company, but I am not a personal proponent of bacteria boosters. Thanks for all you do to make our hobby a better one. I need your opinion as to what would be the best lighting for my future tank. my plan is to have a 90 gallon reef tank (36x24x24) with mostly LPS and some SPS around the top of the tank. must be quiet as it will be in a part time guess bedroom. Also no chiller. So far I am thinking about 3 options. Option No.1 - One XM 250W metal halide within a LumenMax Elite reflector in the center of the tank. In the front and back of the reflector a 36 inch actinic T5. The edge of the reflector would measure 10 inches from the top of the water which means the canopy would need to be 16 inches high as the LumenMax Elite reflector is 5 inches high. Option No.2 - One XM 250W metal halide within a LumenMax Elite in the center of the tank with one 24 inch T5 in the front and one 24 inch T5 in the back of the reflector. There would also be two 24 inch T5s on each side of the reflector. That would be a total of six T5s. One in the front, one in the back and 2 on each side of the reflector. The distance from the water would be the same as option No.1. Option No.3- Use two XM 250W metal halides with LumenMax Elite reflectors with two 36 inch T5s. The edge of these reflectors would be 15 inches from the top of the water which makes the canopy 20 inches high as the reflector is 5 inches high. I am not sure option 3 would work. I was thinking if I used 2 metal halides I could put them higher from the water and that would reduce the heat going into the tank. But this may be too much light. The main thing for my wife is that the tank must be quiet. I am thinking the higher I can put the lights the less heat will get in the tank and the less I will have to use cooling fans. <To toe the line from headquarters, I would go with a 36" hood utilizing two 150 watt HQI lamps. See here. Can you recommend a good and quiet cooling fan? Your site has been very informative! I have a 79x22x27 tank. What kind of MH should I use? How many pieces and watts? I plan to have mostly LPS, soft corals. Maybe some SPS at the upper third of the tank. Have you heard of the brand ATM or Reef Octopus for Metal Halides? And I can light up the tank for 6 hours only right? You are always giving me a great advice. Your site is full of tips and helpful information. I search for info/feedback on a few products, but could not find anything. What do you think about NutriKol food for corals. <Never used the product. Best to post this question on a bulletin board where actual users will input. Might want to try ours here. I mix it with Frozen food and Selcon, and it looks like my LSP <LPS?> like it. Is it a good product? Also I'd like to know if " Reef Bugs" are really hatching, and what exactly is it? And my last question. I not smart enough to find out what is T5 equivalent to compact bulbs <?>. I have six 65w compacts ( two 50/50 and four 10K) for my 75 gallon tank with LPS, SPS and Maxima clams placed on a top of my rocks. I feel I need more, but I don't have enough room to put a halide in my canopy. <If growth/color is fine, leave as is. If not, switching to a six lamp HO T5 system driven by Ice Cap ballasts will tremendously increase light intensity. Do read here and related articles. Please let me thank you and apologize in advance as this will be repetitive to many of you and long winded. Its time to upgrade to some better lighting and move from fish and a couple softies to more of a reef setup. I currently have a standard 75g tank (48x18x20h) with 1-4 inches of sand that my Clown Fish has moved around. My plan is to remove my Clown and Tang (nutrient factories) and leave my Coral Beauty and Gramma. I would like to keep LPS for more color and possibly a Clam. I currently have a Toadstool Leather, a 5" Colt Coral and a rock with some Mushrooms on it. I understand adding more corals will have to be strategically placed regardless of the lighting. I am looking at a MH fixture or a T-5 each have their pros and cons and I can't find the right answers to my questions. MH is the gold standard for lighting, I am considering a 2x150w + T5 for aesthetics or a 8X54w T-5 fixture as an alternative. I have several problems that need to be addressed when it comes to selecting a fixture. First is my water temp runs about 82* all year round due to the pc lights and the skimmer and return pumps. I know 82 is pushing it but at least the temp is stable:). in a short period of time. Even with the glass cover on the tank the humidity never really gets below 40%, not good when its -5 outside. This is why cooling fans for evaporation is not an option. I know that MH will add a certain amount of heat to the water, <Yes> would this size in particular add more than a degree to the temp? What about with the cover on in winter? I understand it will cut down on light transmission but I am more worried about the heat. What about the T-5 fixture? How much heat do they radiate/ transfer to the tank. With a 8x54w fixture (planning on 5-6 sun, 2-3 actinics) can SPS survive/ thrive in a 75g if I wanted to add them at a later date? How noisy are these fixtures with fans? <No problem John. Is your current fixture a pendant or enclosed within a hood? If it is enclosed, then I think the T5 fixture might do ok as a pendant, as this will enable a lot of the heat to escape to the room rather than into the tank. If not, then you will have to consider a smaller 6 bulb pendant T5 fixture w/ internal fans (my choice here actually) which will still be perfectly suited for your system, you do not need 8 T5's over an 18 inch wide tank. Your other alternatives are to stick with the lights you have, or consider a chiller>. Thank you Simon for your reply, much appreciated. I have learned the hard way with this hobby about rushing into things whether it is buying livestock, adding supplements or buying new hardware, a pinch of forethought saves a pound of headaches later. The softies will probably get replaced by hard corals as conditions necessitate. You seem to be confirming my thoughts that the T5 is the way to go for my situation. You said that the six bulb fixture was a better fit than the 8 bulb but that isn't much more wattage than my PC lights. How does this compare to the PC as far as PAR, PUR, LUX etc.. ? That is some of the most difficult info to find anywhere, I understand what wattage means- A x V=W= how fast your electric meter spins. Finding out how (x)W of MH versus (x)W of T5 versus (x)W of PC lights compare to tank penetration, usable light etc... not easy. With a 75g tank what types of hard corals could one expect to keep and would that include a Crocea clam that my wife has been bugging me for three years? I would like to keep more of the light demanding species of organisms but nothing that requires 100kw of lighting either. Will 300w+ of quality T5 bulbs be enough for this? How many sunlight bulbs vs. actinic for happy corals and happy colors? I am thinking along the lines of a Current USA or similar type of fixture that sets on top of the tank with legs, any thoughts? This is how my PC lights are set up. I'm not opposed to a hanging type but it would have to look right in my living room. Lights hanging from the ceiling says warehouse, or at least it would to my wife. Thank you very much for your insights, you are very kind to give us your time an experience! actinics <ok>. Recently, I replaced the MH bulb (about 5 months old at the time, photoperiod about 10 hours.) 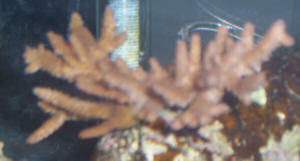 Within a couple of days the Acropora started looking pale all over, with reduced polyp extension <bleached>. Pocillopora etc were fine. I'm guessing that this problem is due to my failure in not adapting the specimen correctly <yes>. I have since lowered the Acropora from 2 inches below the water surface to 2 inches off the DSB. First, I would like to say that you have a wonderful web site with a plethora of information. My husband and I are new to aquarium keeping, and I am finding some of the information overwhelming. I have been trying to research my questions in books and on the Internet, and have been perusing your site for a few days, but I have not seen my particular situation addressed. I hope that you will forgive me if these questions are redundant, and, mostly, I hope you will be able to help me. We've had our aquarium running almost a year now - since November last year: a 55-gallon All-Glass FOWLR with 80 pounds of crushed coral substrate and about 70 pounds of live rock; one powerhead in the tank; a Pro-Clear 125 Sump containing bioballs and a Coralife 65-gal Super Skimmer. Lighting is a two-bulb fixture: Coralife 53008 Compact Fluorescent Fixture w 2 65-w Lamps, 50/50" tubes: True Actinic 03 Blue (50%) and 10,000K Daylight (50%) full-spectrum lights. added perhaps 6 weeks later, a Tuxedo/pincushion Urchin about 1 months after that, and 2 "Nemo" Clownfishes about 3 months after that. We had tried 2 Banggai Cardinals about 5 months out, but they did not make it, unfortunately -- not sure why. Hitchhikers include some feather duster worms, and probably some other critters that have yet to make themselves known - for instance, we saw a tiny crab early on, and a tiny white sea star a few weeks ago - but they both seem to have disappeared. Don't know whether we are stocking too quickly or too slowly, because my spouse wants to put in as much as possible, and I am trying to take it slow - hopefully we are achieving a balance. We've been thinking of adding some soft corals, and this has given us a reason (excuse?) to upgrade our lights, if necessary. family Zoanthidae. Hopefully these will not be too difficult for us beginners! <Not too bad, but do research these animals as to their needs before purchasing. Initially, I've been told that we should upgrade our current lights - I still keep re-thinking this, I am not sure we need to do so. But I've been told that these corals will do well with either Power Compact or T-5 Fluorescents - is there really a big difference over the Compact Fluorescents we have for corals? And it has been recommended to have some white (10K) and blue (Actinic) alternated in the fixture of our choice. However, I am finding it difficult to determine what exactly the differences are between the Power Compacts versus T-5 lights - does one run hotter/cooler, and which types of fixtures would be needed. Also, is a fan required? And if so, is it built into the fixture? And with that in mind, is there a 'package' fixture that fulfills these requirements? We do not want to build this from separate components - but are looking for something that would include everything. Much of the information I've been reading is overwhelming, to say the least. What is a ballast, anyway? which I've seen go up to around 80 degrees. In addition, we usually have our lights set to turn on at about 10am or 11am, and to turn off at about 9:30pm, so that we can enjoy the tank when we are at home in the evenings. Oh, one other point - we do not want to suspend anything from the ceiling. includes mounting or docking legs to be placed over the tank, can be used with the tank covered as we have jumpers, includes lunar lighting, and would ideally include built-in timers. Does such an animal exist? <Sure, you can start by going here. Is wise to price shop at other etailers for the best buy. 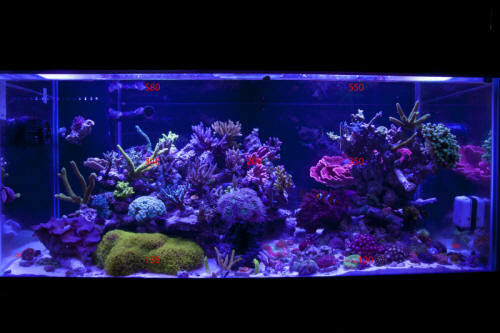 Reading here will help you get a better understanding of reef lighting. Thank you so much for all that you do, and for your kind consideration. P.S. : It was a pleasure hearing Bob Fenner's presentation at last month's MACNA XXI in Atlantic City, NJ. I learned a lot just from that one hour. P.P.S. : I, for one, am very glad that you insist on properly written letters. It is refreshing to find such a professional approach on the Internet, from such a professional crew. <Yes, makes our job much easier if we do not have to correct/edit. Queries that require numerous corrections are returned to the querier for correction. As we are all volunteers with a limited amount of time available, we do not like wasting it doing such. I was looking at the Current USA T5 Nova Extreme 48 " fixture w/ 6 T5 VHOs @54w each. and for PC- 48' 4x65w AquaticLife PC w/ 4 lunar lights. better than pc, and is the T5 Nova Extreme, a good reliable setup? What I meant by giving up was that if I use the hood then I can't use the skimmer, so yes the light is the same but I would lose out on skimming. But would it matter. The LPS I have come from 'not clean' water based on what I read. So maybe it wouldn't hurt in not having the skimmer. If I stay with a glass top I will either add another 65w strip or maybe go to a HO T5. I can get one with 4 -24w bulbs. As far as light for the LPS how does 130w PC match with 96 HO T5. I would love your input in the best route to take for my deep tank situation...seems like there are so many options and various opinions and I'm not sure what to do. I know that I need to upgrade my lighting on my tank and have tried to get as much info on MH, CF and LEDs as possible...it's a little overwhelming and not sure what would be best for my tank. My tank : 20W x 18W x 31H The depth is a factor. The live rock is only about half way up the tank in center...I'll add a picture. Right now I have two BTA, mushrooms and a few soft corals...Maroon Clown, dart fish and some shrimp. All are doing very well, but I don't want to wait till it's an issue. corals/anemones in a tank that deep. You might want to check out the Coralife clip-on HQI fixture which should work well for your tank. See here. Thank you so much for your assistance, it is very much appreciated! Also, right now I put the blue light on for over an hour before turning on the "daylight" (keeping the blue on also) and then when the "daylight" lights go off, the blue lights remain on for a couple hours before turning off for the evening. I have a moonlight for when company is over or want to see the tank in the late evening... Do I still need to do the same with the MH (to simulate sunrise and set) and if so, is it all contained in the MH unit or is that an additional fixture I need to arrange? <If you have nearby window light, it isn't necessary to simulate sunrise. These type of lamps do not come to full power immediately, but rather over a period of a minute or two, so no photo shock should occur. A moon light would work well for the evening period. Thank you so much, this lighting issue seems to elude me. Your experience and advice is very much appreciated! 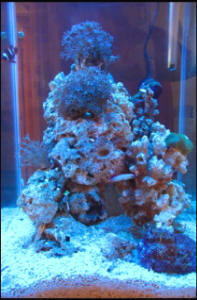 for info on what type of bulbs to put in it which would be best for corals. I ended up purchasing 2 - actinic blue and 2 - 18000k, but then my husband read an article saying 6700k is what the sun is and highest k rating you should use.... Could you recommend the 4 bulbs I should run with, or will what I purchased work? So, even if I returned all the bulbs and got 4 new, the best configuration of bulbs would be 1-18,000k, 1-actinic blue, 1-10,000k, 1-6700k ? Or would you have gone with anything different in a 4 bulb T5 fixture ? With that being said( or typed ) don't hold yourself to what I like. You may want a more blue or white look. If so I would suggest changing the Aquablue to a higher or lower K rated bulb depending on the look you want. Let me just say it's a good thing I work from home, otherwise I'd be fired for spending all day reading articles on your website. Extreme T5HO. It has one 24 Watt 10K bulb and one 24 watt 460nm actinic fluorescent bulb. I know this isn't much, but it'll at least help a bit, right? Also, the manufacturer directions state that it needs to be placed over a glass top; does the glass alter the amount/quality of light going into the water? My next question is about the coral's polyps. The only things I see opening and closing on it are little white extensions on the tips of the branches. Are these polyps? I haven't seen any other sort of extensions on the branches themselves, just lots of bumps, nothing like what I see in pictures online. I've even tried looking a few hours after turning off the lights, and no changes I can see. Would the low lights be affecting this? Would the insufficient lighting also be making the coral spread it's branches out more (it was more upright when I first got it)? Lastly, I've attached a couple of pictures of my coral (sorry for the poor quality) in the hopes that someone can at least tell me if what I have is an Acropora, Montipora, etc, so I can more accurately know it's care requirements, though I understand how hard it is to I'd. coral from not so great pictures. < Hard to tell specifically but definitely an Acropora. Look here for Acro care. Thanks for all the quick answers. Just two more questions (at least for the moment). Should I ignore the manufacturer instructions and mount the fixture on legs and not use a glass top/lid so that I get every bit of light to my coral? Is this safe? And if I were to get another of the same fixtures in the hopefully not too distant future, will there be any heating/electrical issues if I place both fixtures next to each other? I have a hopefully not too dumb of a question about lighting spectrum. I am building a 800 gallon (120" x 44" x 36") in wall reef tank and I'm weighing my options on lighting. The tank will be about 30 inches deep to the top of the sand. I am planning on 36 inches tall with a 6 inch deep sand bed. The tank will have sps corals. I don't know if 2 48" 8 bulb T5HO fixtures will be enough for a tank this deep. What is your opinion? Of course, metal halide is an option, but worried about heat and power consumption. Would I need 250 watt MH or more? Now, the spectrum I want is 14,000K because of the corals and inverts. I was looking at the Lights of America Fluorex fixtures (the 100 watt fixture) but I don't want the 6500K bulb spectrum of these fixtures. First, would it be possible to make a diy filter (possibly blue tinted acrylic) to alter the spectrum, or would I still essentially have 6500K wavelengths that just look blue to the eye. <Hmm, it effectively would change the spectrum by filtering out the red end of the spectrum. I have had the best luck with coral coloration and algae control with 14,000K bulbs. With the cheaper fixture costs and operating expenses, I could use more of the Fluorex fixtures, possible supplemented with actinics. Please give me your opinion/advice on what is the best lighting route to go for this size tank. <I am not much of an advocate for MH these days, but in this case I would go with four 250 metal halides. Thank you for your help with my questions in the past but I have one more. I have read over your FAQ's and have done many Google searches but I have read too much conflicting information so I thought I would just ask an expert. I have a 45 gallon tall tank 24 inches tall. I currently have 2X65W CF lights and 1X65W actinic in a tank that contains 1 large hammer coral, 1 Galaxea frag, 1 open brain, 1 moon Coral and 1 long tentacle plate coral. I wrote in to WWM and James "Salty Dog" recommended using Metal Halide lighting. The time has come for me to purchase one. What wattage would be recommended for these corals and 24" deep tank? Thank you so much for a great website and your response.